Maude Julien has been a therapist for over 20 years, specialising in trauma and in methods of dealing with mental and behavioural manipulation. 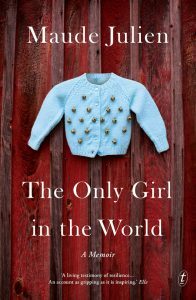 She is the author of The Only Girl in the World, a memoir and “escape manual” in which she tells the story of her childhood, filled with extreme mental and behavioural control at the hands of her parents, and recounts how she managed to break free. She is frequently invited to speak at conferences and in interviews on the subject of psychological hold and manipulation and teaches therapeutic methods of rebuilding oneself after trauma. Maude Julien has degrees in transcultural psychiatry, the psychopathology of babies, and adolescent health. She has also studied behavioural, cognitive and emotional therapy, neuroscience, EMDR (Eye Movement Desensitization and Reprocessing), and Ericksonian hypnosis at the Milton Erickson Institute in Phoenix. She has conducted extensive research on stammering, and co-authored, with researcher Annie Dumont, Stammering, a book on understanding and increasing the acceptance of stammering, treating the underlying cause, and dealing with the condition in day-to-day life.